Nose: Fruity notes of mango and apple, and the bouquet is a delicate cherry blossom. Palate: Wild honey with ginger and vanilla sweets. The finish is full bodied and rich, like a dessert wine with orange marmalade. The prestigious independent Cognac producers Comandon have finished up their first ever experiment with cask finish Cognacs in Spanish wine barrels previously used for ageing wine. The Comandon Rare Cask Finish in Ex-Ribera Casks is a wonderful addition to their single cask series, and a Vintage Cognac that dates back to 2013. The Cognac house have chosen to hone in on the refined Petite Champagne terroir, which is known for producing light and fine Cognacs. With soil that is predominantly composed of chalk, it is larger than the other half of the Fine Champagne area, but produces a delicate floral bouquet. Viña Pedrosa are a very well respected winery in Ribera del Duero, Spain in its northern plateau of Castile and León. Comandon used their 100-point rated wine casks made with American oak that have previously aged their fine Spanish wine, but to mature their Vintage eaux-de-vie from the Petite Champagne. Viña Pedrosa themselves have a reputation for fine vintages, rated between 98 and 100 points. They also won the award for the best Wine Estate in Spain in both 2017 and 2018. It is a pioneering collaboration and experiment to create the Comandon 2013 Single Cask Petite Champagne. The single cask was made into 215 bottles. Founded in 1821, the Comandon Maison is believed to be the oldest house in the whole of Cognac’s Old Town. Dating back to Roman rule, its foundations are home to much prestige. The philosophy behind this independent Cognac brand and their single cask range is that once it’s gone, it’s gone. 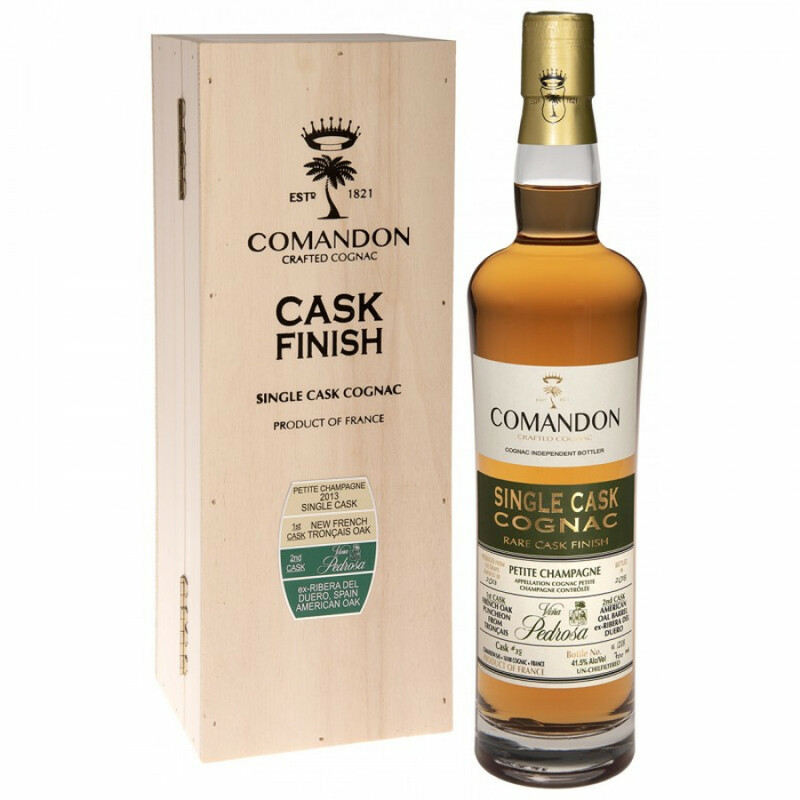 Another exciting Cognac launch in this single cask series is the Comandon Single Cask 2012 Fins Bois aged in Ex-Banyuls barrels. A Vintage Cognac of this rarity is best enjoyed neat, in order to experience the full expression of the Petite Champagne terroir. It arrives in a ash coloured wooden box.